- Names can be listed in alphabetical order by Given name (First name), many times recorded as an abbreviaton. Example: Panag = Panagiotis. - Since many of the names are in order by Given name you will have to look at the entire community to find multiple members of the family in the same village. Many times a father is still alive and you will be able to find him in these electoral lists. This can help advance you family history research back to the early 1800's. 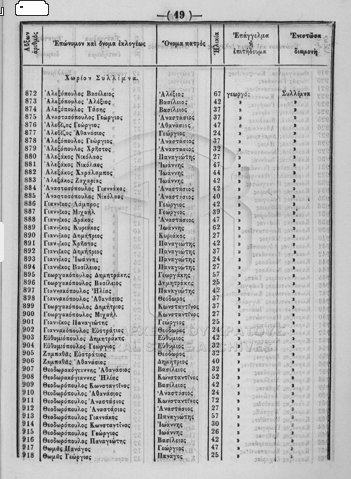 Example: Year of Election List is 1872. Father's age is 65. Birth year would be calculated as 1807. 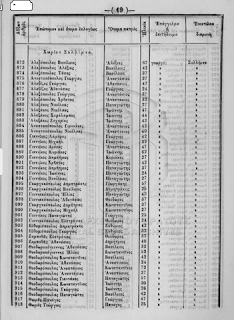 978 - Καραμπελας Γεωργιος - Δημητριος - 47 - αλευροπωλης - Προνοια Ναυπλ. 978 - Karambelas Georgios - Dimitrios - 47 - flour seller - Pronoia Nafpl.